Three “Lanum” boys played football at the University of Illinois between 1910 and 1930 and all went by the name “Jake.” Older brother Harold played tackle in the pre-Zuppke days [1910-1912] and was on the 1910 team that shut out all seven opponents and claimed to have participated in the first Homecoming game in the nation. Younger brother Frank was a star quarterback at Decatur High School and then for four years at the U of I [1927-1930]. 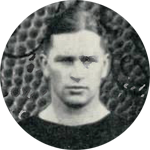 But middle brother Ralph is the only “Jake” to play on the 1918 U of I Big Ten Championship team, two years for the Decatur Staleys and three for the Chicago Bears. Over the next three years he played in 28 games for the Chicago Bears while supplementing his football earnings by working for Inland Steel Works in Indiana. He married Margaret E. Wolfe in January 1923. After his professional football career ended he worked mostly for oil companies while living in Hammond, Indiana. In 1959 he retired from the Cities Service Oil Company and moved to Homewood, IL. He passed away at the age of 71 in 1968 and was interred at the Assumption Catholic Cemetery in Glenwood, Illinois.